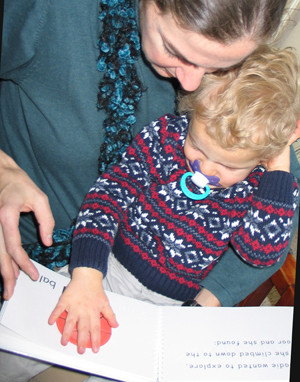 Sadie Can Count can be used in many different ways: as an introduction to counting, as an introduction to print and/or Braille, as an introduction to colors and rhythm, and as an introduction to picture recognition both visually and tactually. Sadie Can Count has multi-sensory pictures throughout. If your student or your child wants to access the pictures tactually, you might try a few techniques we have learned to make interpreting tactile pictures easier. Please don’t feel that you need to do all these suggestions before you simply sit down and enjoy sharing a story. This is a learning experience and can be achieved over time. It is most important that you both enjoy the journey. Add information as curiosity makes it appropriate. If you want to point out something to a student, try this technique. Using only one finger touch the object that you want to show your student. Then ask them to find your finger. They can quickly scan the page and will bump into your hand. Once they find where the tip of your finger is pointing move it aside so that they know exactly what you want them to touch. Or you can gently tap the picture with one finger at the place you want to point out. If you do this too much it can get annoying for some people. If that is not working try telling the student you would like to show him or her something, and then draw your hand from under the student’s elbow up to his or her hand. Instruct the student to follow your hand to the point you wish him or her to inspect or to follow along if you are describing an area. With a bit of practice this method becomes more natural. Any of these techniques allow the student to “see,” without feeling forced. The student is in control of the stimulation his or her tactile receptors are receiving because you are not holding their hand. All of the objects pictured in Sadie Can Count are common objects. Collect the items and use them to explain how the two dimensional picture in the book is a picture of the real object. Supervise these activities appropriately for your child or student. Children will want to use all their senses so many children will smell and even taste the objects, monitor their activities carefully. • Ball: A basketball is pictured but you can use any round ball. • Socks: Use any pair as long as the socks have a turned heel and ribbed top. • Books: Sadie Can Count is the real book and inside of it is a picture of three books. • Blocks: You can purchase toy blocks or you can cut numbers and dots out of sandpaper and glue them onto wooden blocks. If the blocks are not exactly alike, this gives you an opportunity to generalize as an exercise in categorization. • Seeds: Dried giant lima bean can purchased at most grocery stores. • Leaves: Lilac or other leaves of approximately same shape work well. In winter, you could cut out felt leaves and apply veins with puff paint. Point out to your student or child that the felt leaves are not real. • Keys: any set of keys on a bead chain will work. • Shells: Many craft stores stock sea shells. • Bells: Bells are also available at craft stores in many sizes and styles. Check clappers and make sure they are secure. It may be instructive for the child to experience that a bell without a clapper does not ring and a bell with a clapper does. • Wooden beads: A variety of different shapes is available in bags at craft stores. A very good exercise for the student is to make the beads out of an oven baked clay, homemade or store-bought play dough. String the beads on a shoelace or ribbon. Most craft stores will carry these items. First, allow the student to examine the real object thoroughly. When your student is ready to examine the pictures, it is helpful to display the real objects in a manner that will aid the student in making the transition from a three to a two dimensional format. – Flat objects like the socks, seeds (giant Lima ), leaves (lilac) or shells (scallop), can be arranged on the table one or more at a time. If they are lightweight and it is difficult to keep them in place when the student is looking, try gluing or taping them onto a piece of paper or cardboard. – Objects like keys or beads can be arranged on the table similar to the arrangement in the picture. – Sadie Can Count is the real book, so you will be flipping back and forth from the real book to the pictures of the book. -Three-dimensional objects, such as the ball and the bells, need to be oriented at arm’s length in the same position as pictured in the book. We show it at arm’s length so that the student is not able to reach around to the backside of the object, the unpictured side. The student can run their extended finger around the outside of the object and identify the outline of the picture. The student can also explore the face of the object to identify details in the picture. If possible, use two hands on the picture. Even if one hand is not very active, simply by being on the page it will help orient the objects on the page. I find it is good to have a place keeper to refer back to. Everyone will develop his or her own techniques to accomplish this task. Allow your students to find their own way. If they are having fun, they will improve with practice. If your child or student is getting frustrated, then it is time to start suggesting some other techniques. You can suggest they try a quick scan of the entire picture to get the overall layout. You can suggest they try scanning from left to right and from the top of the page to the bottom. Don’t be too worried about specific techniques, trust that the child wants to learn and will make mistakes but also make discoveries. It is important that the child be allowed and encouraged to explore – whether in the book or in their environment. Each success will build skill sets that can translate into future successes. Discuss similarities and differences between the actual object and the picture. For example, the actual sock could be larger, uncuffed and softer, but it would also have a toe, heel, and ribbing. Categorization is an important learning and organizational tool. As a special activity, set aside some time to explore as many different kinds of seeds as possible, at another time search for as many different kinds of leaves, or balls, or any category of objects. Take turns finding differences and similarities. A group of children can do this activity together. The first three pictures, ball, socks and books, are primary colors; red, yellow and blue. The next three are secondary colors; purple, orange and green. You might want to do color mixing as an activity by seeing what secondary colors you can make by mixing two primaries together. You can use play dough or paints. The shells and bells explore rhythms. The shells have a rhythm patterned in the ridges and another rhythm to the spacing between each shell. Each of the lines of bells has a different rhythm. Pattern and spacing discernment are skills,which should prove useful in learning to read and write Braille and as well as developing drawing skills. Students can also develop tracking skills, helpful in Braille reading, by tracing their finger around the loop of beads. It is important that students be given time, frequently and lots of it, to just look at things, time to look at the real objects and time to look at the pictures. Sighted people, in addition to studying objects and pictures, frequently gaze at objects and pictures in their environment. Blind and visually impaired people should be encouraged and respected when they do the same. Take time and engage in the conversation, reading together stimulates young minds. Your child will be rewarded with the skills and knowledge that will help them become informed and contributing members of society. This entry was posted in Downloads & Guides. Bookmark the permalink.